For the locals Easter is usually considered a family time and where you stuff yourself with delicious chocolate Easter eggs. The Easter in Iceland is in effect like a five day weekend and all schools, offices, banks and such are closed. Many shops are also closed during this time so it is not the ideal time to visit if you intend to shop a lot but for most it is not the reason for their visit. Most restaurants and cafés are open during Easter and all day tours are operated as like every other day. For Icelanders the Easter holiday is often longer than during Christmas with Maundy Thursday, Good Friday, Easter Sunday and the following Monday being public holidays. During Easter it is very popular for Icelanders to rent a cottage in the country side, relax and spend some quality time with their families. If conditions allow going skiing is also a popular past time and towns like Akureyri in the North and Ísafjörður are packed with skiers. Ísafjörður also hosts a popular music festival at this time called "Aldrei fór ég suður" . Although being a music festival it has a very relaxed vibe where all the organizers and staff are working for free making this happen. 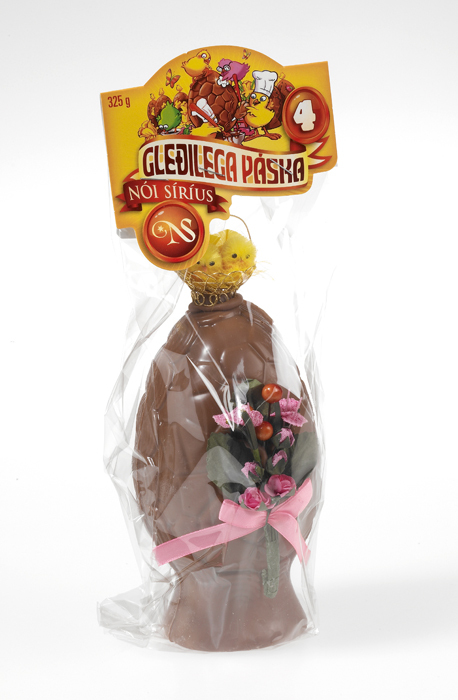 The Chocolate Ester egg or páskaegg in Icelandic is a must during Easter. Theses chocolate eggs come in different sizes from very small up to the size of a human head. They are all stuffed with all sorts of candy and in each egg is a small piece of paper with traditional proverbs or sayings. If you end up in a family gathering in Iceland you will probably hear people ask each other what proverb or saying they got in their egg. Translating those sayings into English can be hilarious so getting a egg and ask an Icelander to translate it for you can be a great conversation starter.